Exactly 9 days from now, my parents would be celebrating their 50th wedding anniversary.They actually got married 24th of January 1958..and because it falls on a Thursday this year we decided to have their renewal of vows on the 26th since it’s the nearest Saturday. 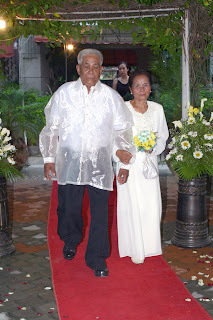 I really am blessed to see them still together after 50 long years,and I know it is just but proper to give them some sort of celebration,after all not so many couples are given the chance to celebrate their golden wedding anniversary. Some go separate ways, others simply don’t reach the old age to celebrate their 50th..So yes, I am grateful that God has gifted my Nanay and Tatay a long life and a long marriage life. Of course, their marriage is far from perfect..there are times I thought they will also be separated, there were many fights, too many troubles and too many hardships and we’re all part of them..but still,they manage to survive and brought us all up together..I think it’s one clear illustration of how a marriage should be. We,their kids,don’t need to hear it from them anymore..It’s clear that Marriage is a lifetime commitment. And of course, I am the wedding planner from the ceremony to reception and to what’s gonna happen on that day..ako ang culprit..
We will be all wearing gold gowns J and we bought a gold candle holder for the souvenir and put it in a gold pouch bag, I DIY the invitations,, I accentuated it with gold stickers that I also made my self. Nanay will be wearing a two piece golden gown..simple but I know it will look good on her, she actually liked it when I show her the picture. It’s not really grand..they will renew their vows on our small Christian church located just beside our home and dinner/reception will be at the front yard of our house.. but still we want to give them the best and we want them to feel special on this day. We invited old friends of them and some relatives to share with our happiness. I’ll blog about it right after the wedding.